Explain reflection of light from polished and rough surfaces. Whenever we look into a mirror, or squint at sunlight glinting from a lake, we are seeing a reflection. When you look at this page, too, you are seeing light reflected from it. Large telescopes use reflection to form an image of stars and other astronomical objects. 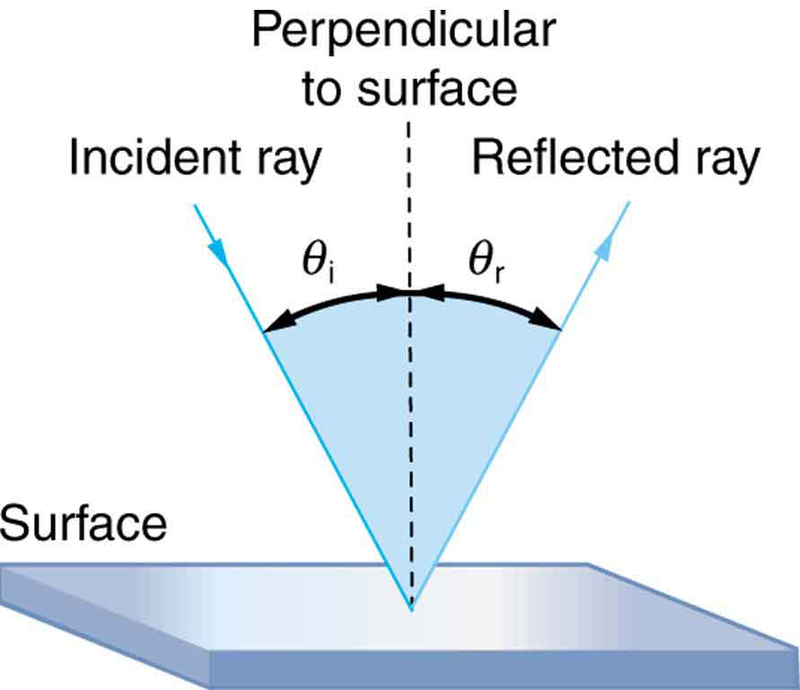 The law of reflection is illustrated in Figure 1, which also shows how the angles are measured relative to the perpendicular to the surface at the point where the light ray strikes. 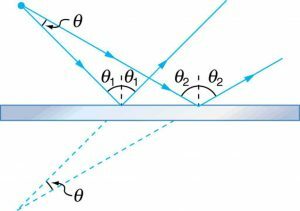 We expect to see reflections from smooth surfaces, but Figure 2 illustrates how a rough surface reflects light. Since the light strikes different parts of the surface at different angles, it is reflected in many different directions, or diffused. 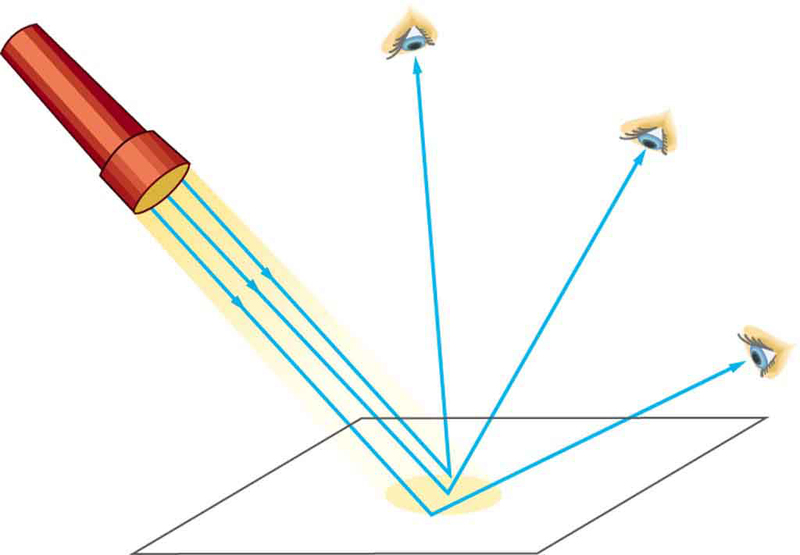 Diffused light is what allows us to see a sheet of paper from any angle, as illustrated in Figure 3. Many objects, such as people, clothing, leaves, and walls, have rough surfaces and can be seen from all sides. 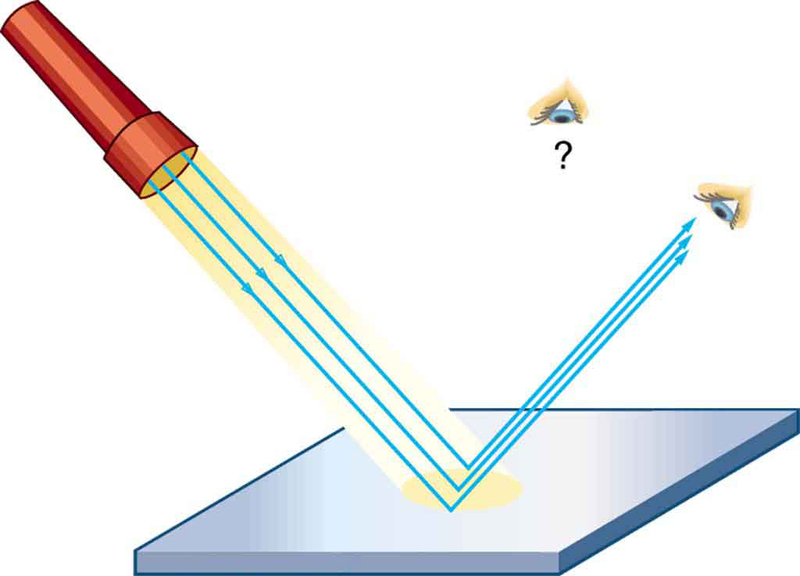 A mirror, on the other hand, has a smooth surface (compared with the wavelength of light) and reflects light at specific angles, as illustrated in Figure 4. 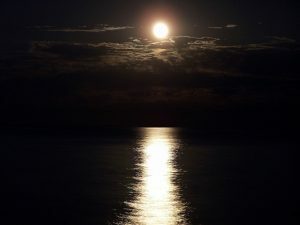 When the moon reflects from a lake, as shown in Figure 5, a combination of these effects takes place. Figure 1. The law of reflection states that the angle of reflection equals the angle of incidence— θr = θi. 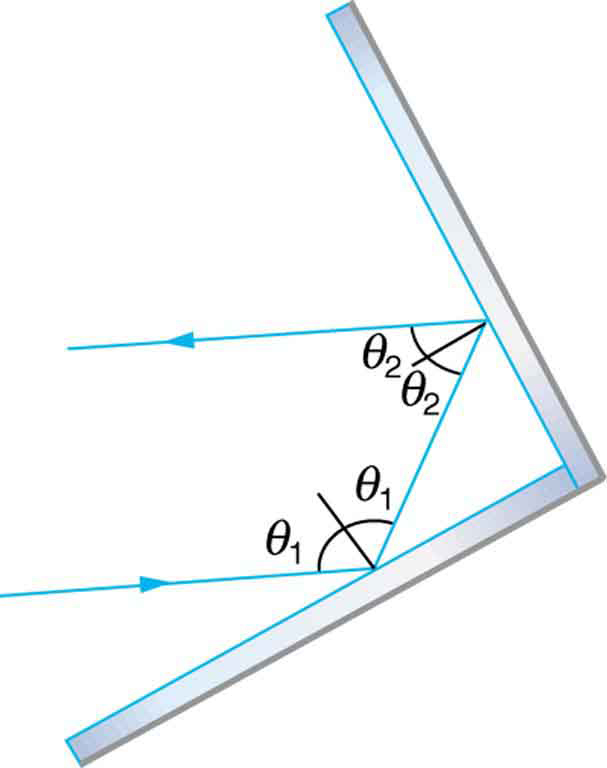 The angles are measured relative to the perpendicular to the surface at the point where the ray strikes the surface. Figure 2. 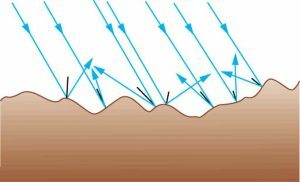 Light is diffused when it reflects from a rough surface. Here many parallel rays are incident, but they are reflected at many different angles since the surface is rough. Figure 3. When a sheet of paper is illuminated with many parallel incident rays, it can be seen at many different angles, because its surface is rough and diffuses the light. Figure 4. A mirror illuminated by many parallel rays reflects them in only one direction, since its surface is very smooth. Only the observer at a particular angle will see the reflected light. When we see ourselves in a mirror, it appears that our image is actually behind the mirror. This is illustrated in Figure 6. We see the light coming from a direction determined by the law of reflection. The angles are such that our image is exactly the same distance behind the mirror as we stand away from the mirror. 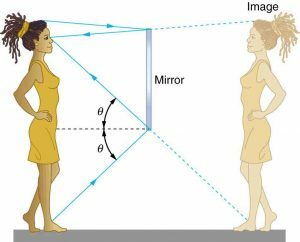 If the mirror is on the wall of a room, the images in it are all behind the mirror, which can make the room seem bigger. Although these mirror images make objects appear to be where they cannot be (like behind a solid wall), the images are not figments of our imagination. Mirror images can be photographed and videotaped by instruments and look just as they do with our eyes (optical instruments themselves). The precise manner in which images are formed by mirrors and lenses will be treated in later sections of this chapter. Figure 6. Our image in a mirror is behind the mirror. The two rays shown are those that strike the mirror at just the correct angles to be reflected into the eyes of the person. The image appears to be in the direction the rays are coming from when they enter the eyes. A mirror has a smooth surface and reflects light at specific angles. 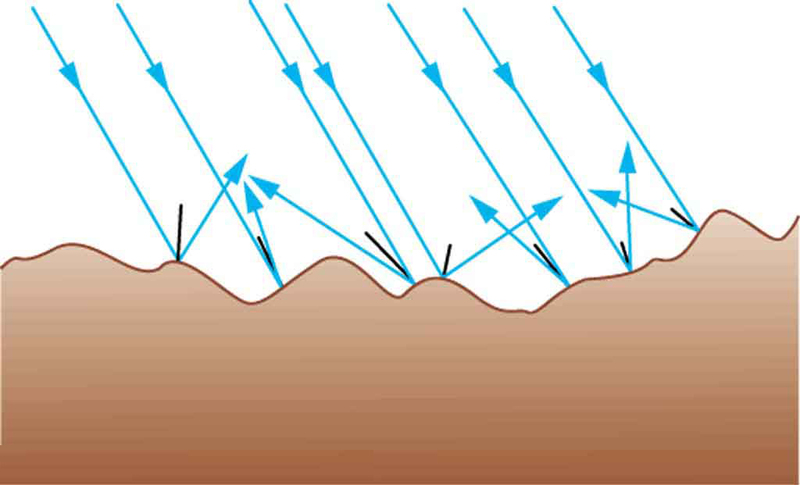 Light is diffused when it reflects from a rough surface. Mirror images can be photographed and videotaped by instruments. 1: Using the law of reflection, explain how powder takes the shine off a person’s nose. What is the name of the optical effect? 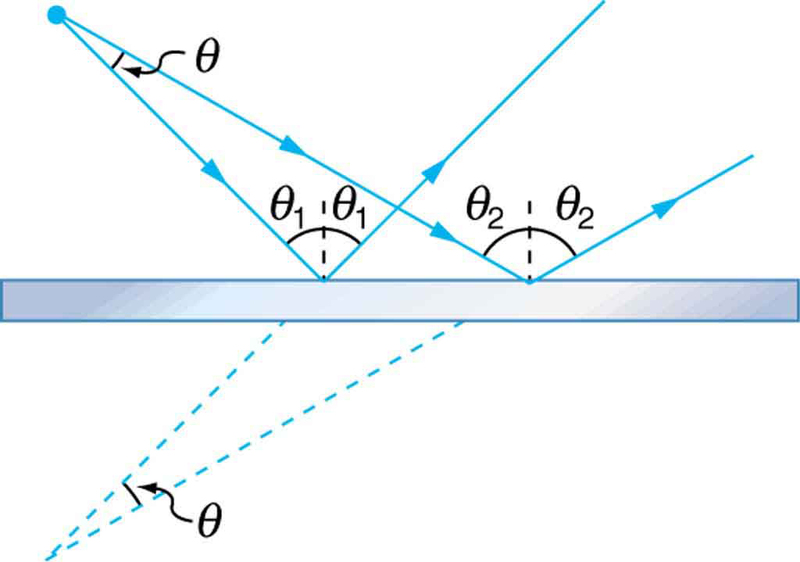 1: Show that when light reflects from two mirrors that meet each other at a right angle, the outgoing ray is parallel to the incoming ray, as illustrated in the following figure. Figure 7. A corner reflector sends the reflected ray back in a direction parallel to the incident ray, independent of incoming direction. 2: Light shows staged with lasers use moving mirrors to swing beams and create colorful effects. 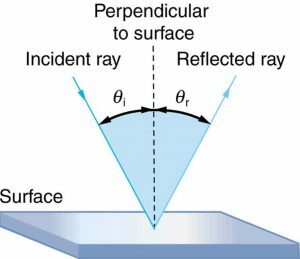 Show that a light ray reflected from a mirror changes direction by when the mirror is rotated by an angle . 3: A flat mirror is neither converging nor diverging. To prove this, consider two rays originating from the same point and diverging at an angle θθ. Show that after striking a plane mirror, the angle between their directions remains θθ. Figure 8 A flat mirror neither converges nor diverges light rays. Two rays continue to diverge at the same angle after reflection. 25.2 The Law of Reflection by OpenStax is licensed under a Creative Commons Attribution 4.0 International License, except where otherwise noted.